Want to find the best sniper/precision rifle for you as a beginner? You’ve come to the right place. We’ve already covered our best recommendations for pistols, rifles, and shotguns, and now we dive into the world of long distance shooting. For the introductory long distance rifle, we recommend going with the 7.62x51mm / .308 Winchester cartridge. It is one of the most widely used rounds so you’ll be sure to find tons of information and it is available for a reasonable price (starting at ~75 cents a round). Plus it’s good up to 800 yards and beyond. Bolt action rifles are the go-to for accuracy’s sake since there’s less movement going on when the round is fired. They are also easier to make accurate than with a semi-automatic for a number of sciencey reasons. However, there’s been a lot of progress in semi-autos that are getting them close to on-par with bolt guns, out to reasonable distances. 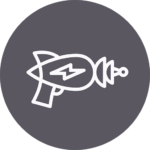 However, the ability to rapidly re-engage a target without working the bolt might push you towards this route instead. You want to eliminate the contact between the stock and the barrel for two main reasons. First is that the stock can change with outside influences such as weather or use. This would alter the alignment with the barrel over time. Second, you want the barrel to be able to vibrate at its natural frequency. In normal rifles, the barrel rests on the stock, but in free floating barrels, there is no touching of the barrel with the stock. 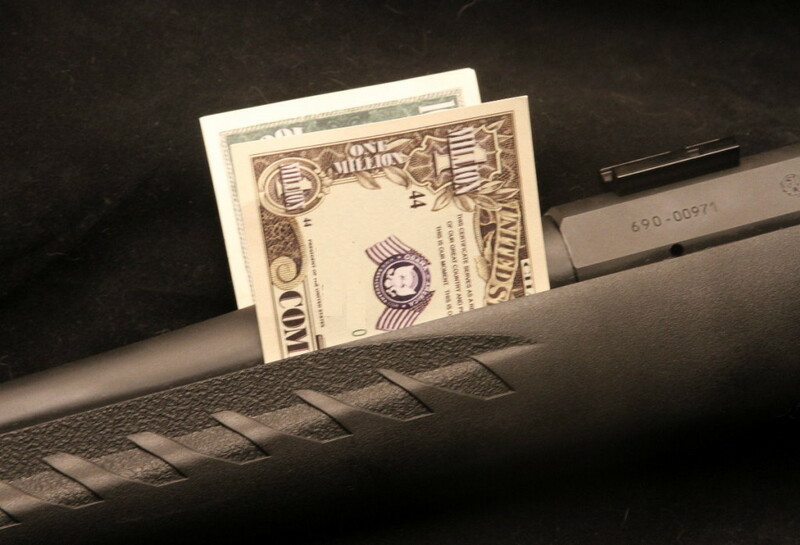 The standard test is to see if you can slide a dollar bill between the barrel and stock. Since it’s a beginner rifle, we’re looking to keep the whole package around $1000 including the scope. 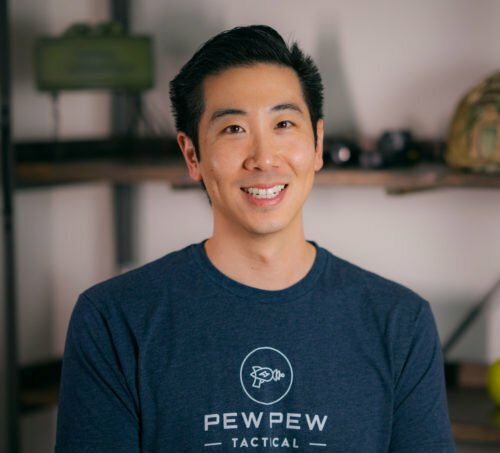 Ammo is also more expensive for precision rifles (with Match ammo running up to $1.50 per round and standard ammo at around 75 cents per round). But check out our recommendations in our online ammo buying guide. Ready for some recommendations of the best? A Finnish rifle that weighs in at 6.5 lbs and can shoot 1 MOA (1″ at 100 yards) out of the box. Again, there’s tons of upgrades for this sweet gun which clocks in at about $600-$700. Also available in south paw for you lefties out there. The AXIS is great value for the money ($400-$500) and tons of upgrades available. Also take a look at the law enforcement models which have an upgraded trigger and a heavy barrel. You might have heard of the AR-15 which fires the .223/5.56 round, but it was originally designed to fire the .308/7.62 round as the AR-10. 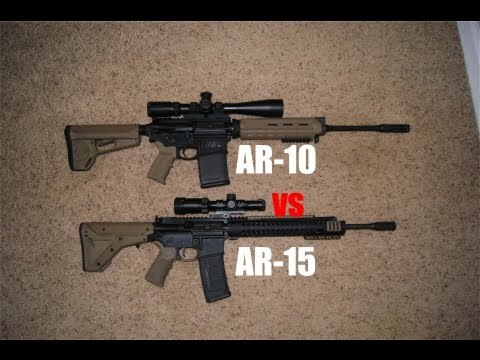 At a side glance you might not be able to tell the difference between an AR-10 and an AR-15, but the AR-10 is slightly larger over for both the lower and upper receiver. However, most of the lower receiver internals and furniture are interchangeable. As an AR platform, many manufactures make an AR-10 style rifle for precision shooting. 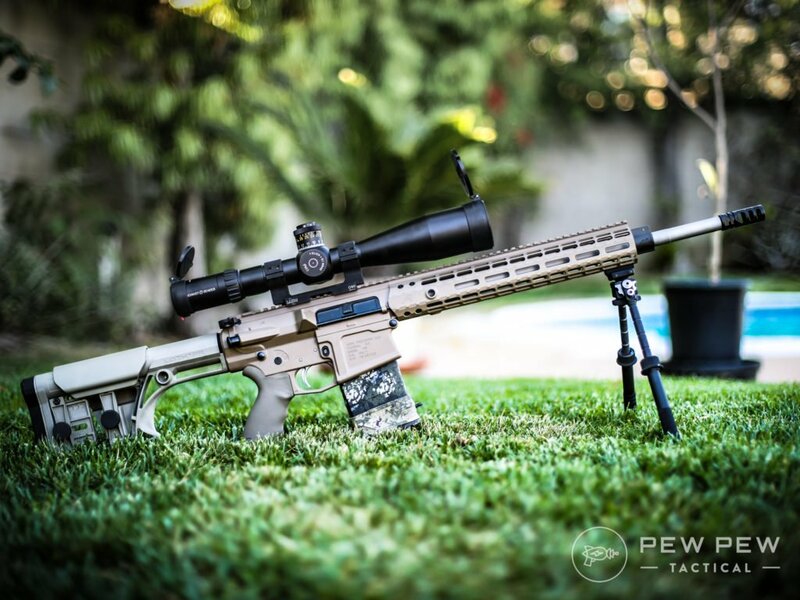 Our go-to is with Aero Precision’s M5E1 line ($1300-1600) which will push your budget a little higher to almost $2000 with a good scope, but now you are ready to send a lot of (accurate) lead downrange. Full review here. Looking for more AR-10 options? Check out our Guide to the Best AR-10s. Once you have your rifle, don’t cheap out on the scope rings. An accurate rifle is pretty useless if the thing holding your scope to it is wobbling around. We actually recommend going with a one-piece mount so you don’t have to deal with the potential headache of aligning rings shown above. 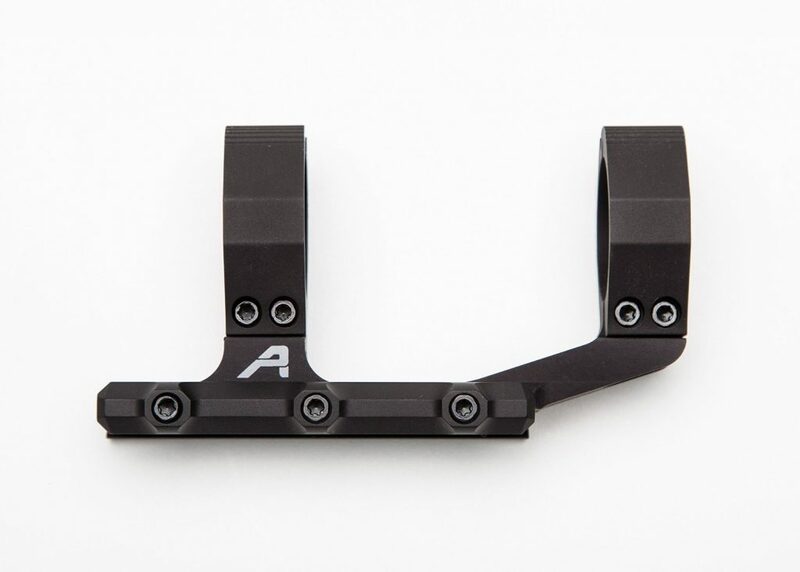 For a cheaper (but heavier) option, we love the Burris PEPR mount ($65) or for slightly more you can shave 5 oz off your rifle with Aero Precision mounts ($80). I would suggest the “extended” version and remember to match the mount with your scope (either 30mm or 1 inch typically. Another thing where you don’t want to skimp. You’ll always hear the adage “Buy Once, Cry Once” with scopes since if you have a quality scope, you can always put it on a better rifle. A good rule of thumb is to match it up with your rifle in an almost 1:1 ratio. 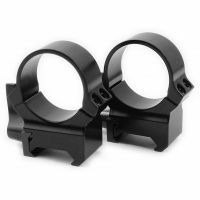 It’s better to get the cheapest AXIS we mentioned above but pair it with a decent $300 scope. And scopes do get really expensive…our favorite is Schmidt and Bender’s PMII which retails for around $4000. You’ll also want to pair up the power of the scope with your purpose. Do you want more zoom to hit really far targets, shoot competition where just 1-4x is needed, or a more middle of the road 3-9x? Check out our Optics and Scope Guide for the AR-15. Since you’re going precision/sniper rifle, you’ll want to disregard the 1x optics and focus on magnified scopes. And if you’re going strictly long-distance…check out our How to Choose a Rifle Scope article. What precision/sniper rifle did you end up getting? Let us know in the comments! When I was looking, the Remington 700 (a TRUE 700, not a falsely marketed 770) was more than I could afford. The Ruger American came out around then, with a floated barrel and accuracy really close to the R700. That’s what I got and I have been pretty happy with it. Retailing at around $400, I think it deserves at least an honorable mention in this list. I am going to get the one not mentioned here; Savage Tactical with the 20″ barrel and AR10 mags. Congrats! Reaching out that far for the first time is a lot of fun. If you’re looking for your next upgrade, I would highly recommend you look at Tikka, Ruger, and Savage. All three have been putting out some outstanding bolt guns for decent prices. You obviously deal mainly with novice shooters here. I was hoping to gain a bit more intel on my Mosin Nagant and my 8mm Mauser. 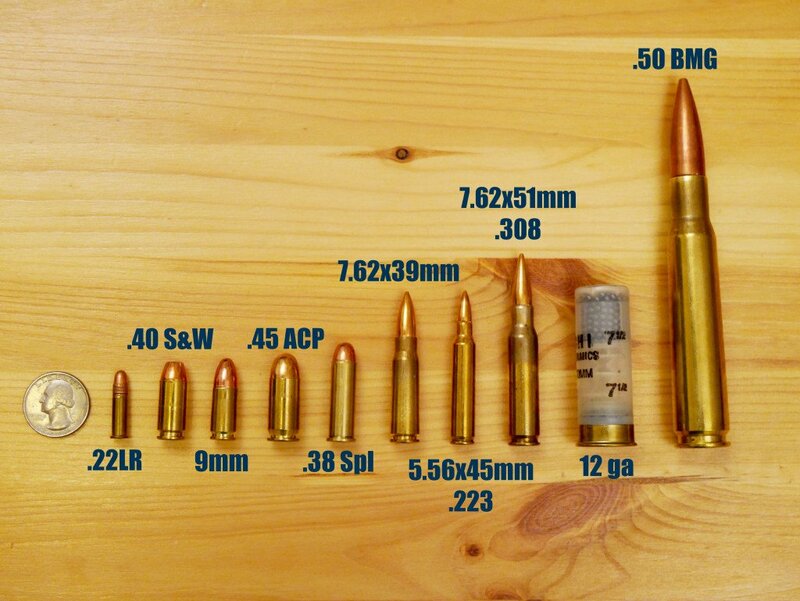 In your pictured ammo, I didn’t see any 7.62x54r or 7.65×53 rpumds. Being a long-gun shooter, I am always looking for something I didn’t know about my weapons of choice since my military days. I hope to catch some information on your site as it looks interesting. Thanks for the targets.